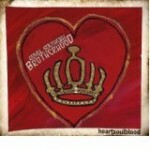 Share the post "Album review: ROYAL SOUTHERN BROTHERHOOD – Heartsoulblood"
Royal Southern Brotherhood’s ‘Heartsoulblood’ is a delightful celebration of the band’s talented parts. Sure, they are bound by a rock royalty bloodline that makes them a de facto supergroup, but each member of the band is an integral and equal part of an album full of soulful funky grooves explored in an adventurous array of wide ranging musical styles. ‘Heartsoulblood’ is an organic record right down to Yonrico Scott’s front cover art work. It’s heavy on feel and bound by intricate band interplay. It may be a couple of songs short of being a great record, but there are enough highlights and magical moments to keep you coming back for more. RSB build their music from the ground upwards, with the mighty rhythm section of Yonrico Scott and Charlie Wooton locking into a succession of deep grooves with the twin guitar and vocals of Mike Zito and Devon Allman. Cyril Neville adds the defining magical fairy dust with his unique sparkling percussion and trademark soulful vocals. The radio friendly, soul dripping ‘She’s My Lady’ blends Cyril’s consummate compositional skills with the band’s deft harmonies and crisp percussive skills over a Bossa rhythm. On ‘Takes A Village’, there’s lyrical substance to match musical depth and subtle gospel vocals, as Mike Zito indulges himself with some Steve Miller style phrasing. Producer Jim Gaines has that rare ability to make a great tour band sound interesting, exciting and polished in the studio. He captures their spark and shapes it into a coherent flow that gels the album together. That point is illustrated by the way the ‘Heartsoulblood’ is topped and tailed by the Mike Zito’s slide-led opener ‘World Blues’ – which features alternate verses from Mike, Cyril and Devon with Doobie Brothers style harmonies – and the reggae inflected mantra ‘Love & Peace’. The latter offsets a repeated chanted hook with some restless percussion and a buzz tone guitar, and sounds as if it was specifically written to book-end the album. ‘Heartsoulblood’ is an album in the old fashioned sense of the word. And if that stands at odds with the contemporary world of downloading tracks at random, then it’s counterweighted by the mellow funk of the Allman-led ‘Groove On’ – with it’s wah-wah sculpted solo over an imperious rhythm track – and ‘She’s My Lady’, which are both potential singles. The percussion heavy funk of ‘Here It Is’, is a great example of the way Cyril’s writing is coloured and shaped by the band’s grooves and guitar lines, while ‘Callous’ comes from the award winning Neville/Zito combination. It features a Robin Trower-style repeated opening riff and an enveloping soulful groove, cemented by Yonrico’s big drum sound, and topped by Cyril’s emotive vocal. Everything about this album is nicely balanced and evidenced by the way ‘Ritual’ is followed by Devon’s heartfelt baritone inflected ballad ‘Shoulda Known’. The riff driven, Cyril and Omari Neville penned ‘Let’s Ride’, comes with the RSB imprint of a soulful funky groove and glistening harmonies, and Devon’s rapped out vocal on ‘Trapped’ mirrors the lyrical intensity of a doomed relationship, though it stands in sharp contrast to the uplifting melodic groove. This entry was posted in ALBUM REVIEWS, ALBUM REVIEWS (Mobile), All Posts and tagged album, Charlie Wooton, Cyril Neville, Devon Allman, Doobie Brothers, funk, Heartsoulblood, Jim Gaines, John Sinclair, Mike Zito, Omari Neville, review, Robin Trower, rock, Royal Southern Brotherhood, soul, Steve Miller, Yonrico Scott. Bookmark the permalink.